The Imperial Fora (Fori Imperiali in Italian) consist of a series of monumental fora (public squares), constructed in Rome over a period of one and half centuries, between 46 BC and 113 AD. The forums were the center of the Roman Republic and of the Roman Empire. 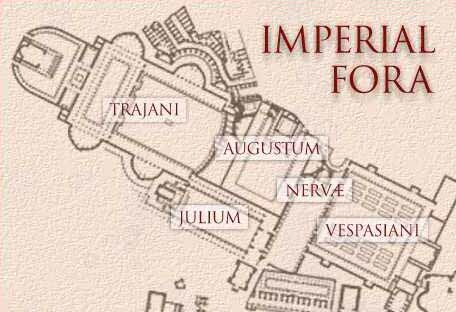 The Imperial forums, while not part of the Roman Forum, are located relatively close to each other. Julius Caesar was the first to build in this section of Rome and rearranged both the Forum and the Comitium, another forum type space designated for politics, to do so. These forums were the centres of politics, religion and economy in the ancient Roman Empire. During the early 20th century, Mussolini restored the Imperial Fora as part of his campaign to evoke and emulate the past glories of Ancient Rome. But he also built the Via dei Fori Imperiali across the middle of the site, supposedly in order that he could see the Colosseum from his office window. The modern street and its heavy traffic has proved a source of damage to the buildings because of vibration and pollution. There have been a number of proposals to remove the road, but none have taken effect. The Forum of Caesar, also known as Forum Iulium or Forum Julium, Forum Caesaris, is a forum built by Julius Caesar near the Forum Romanum in Rome in 46 BC. 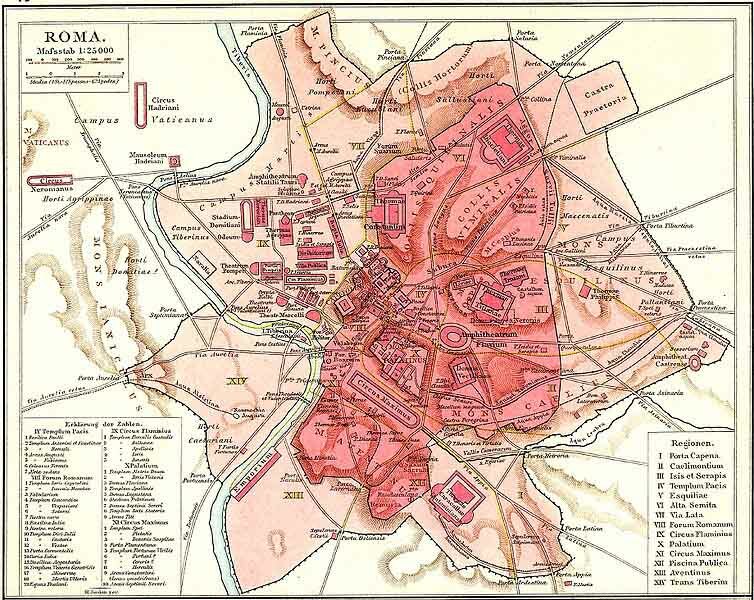 Caesar decided to construct a forum bearing his name in the northeast section of the Forum Romanum, of which he purchased a very expensive, select amount of parcels of land in that area. Forum construction began in 54 BC, and it was dedicated to Caesar and his deeds in 46 BC upon completion. Some scholars, however, believe that Augustus furnished the west side with the shops and offices that were considered part of the Forum of Caesar, therefore being the one to see its completion.The Forum spanned from the Argiletum on the southeast side of the Forum Romanum to the Atrium Libertatis and spanned 160 meters by 75 meters. As part of the dedication, lavish games were offered and funded by Caesar, indicating the staggering cost and thus the personal interest that Caesar had invested in the project. The Forum of Caesar originally meant an expansion of the Forum Romanum. The Forum, however, evolved so that it served two additional purposes. As Caesar became more and more involved in this project, the Forum became a place for public business that was related to the Senate in addition to a shrine for Caesar himself as well as Venus Genetrix. Before his assassination, Caesar would have the Senate meet him before his temple, an act deemed very unpopular by the Senate. 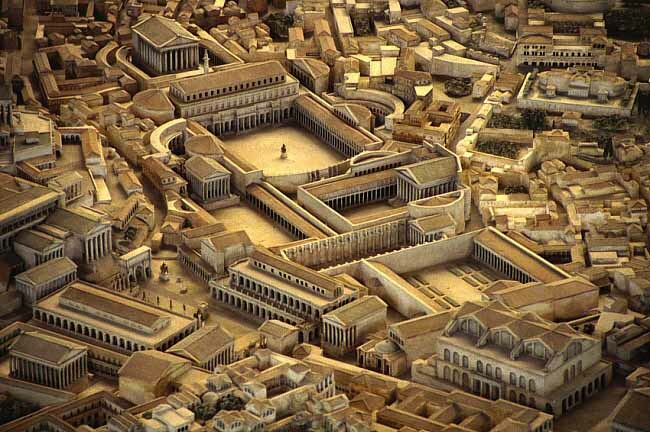 The Forum of Caesar also had an effect on the Curia, which Caesar began to reconstruct in 44 BC. 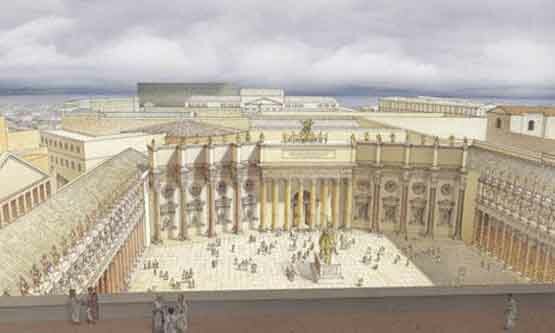 This reconstruction moved the Forum of Caesar much closer to the Curia. The ten tabernae located on the western side of the Forum and its now close approximation to the Senate house symbolized the unity that Caesar felt between him and the Senate. Caesar also placed a statue of his favorite horse in front of the temple. Following his assassination, a statue of Caesar riding this horse was added. Caesar (gens Julia) claimed descent from Venus through his ancestor Julus. 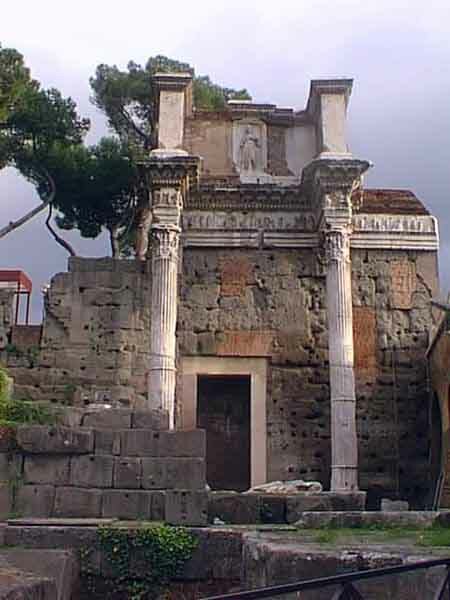 The Temple of Venus Genetrix was completed after Caesar's assassination by Roman senators, which included lavish games in reference to Caesar's original dedication to the Forum. Caesar had plans for this temple well in advance, having dedicated the construction of a temple to Venus Victrix at the climactic Battle of Pharsalus in 48 BC, though never being able to see its completion. This original dedication was done because it was Pompey's favorite goddess, and Caesar hoped to gain the goddess's favour before the battle against Pompey. The Temple of Venus Genetrix contained an important collection of statues, paintings and engravings. A gilded statue of Cleopatra VII was erected, setting a precedent for dedications to notable women in the precinct. Paintings in the forum included one of Medea, mythological Greek hero of Euripides' play Medea, as well as one of Ajax, mythological Greek hero of Sophocles' Ajax, done by Timomachus. Perhaps more personal to Caesar were six collections of engraved gems. These surpassed in number the collection of Mithridates dedicated by Caesar's rival Pompey. It is not known where or how Caesar obtained these six collections. Following the reigns of Caesar and Augustus, a total reconstruction of the Forum took place, headed by the Roman Emperor Domitian. Why this reconstruction occurred is not exactly known. Under the reign of Titus, a massive fire ravaged the city in AD 80, including the Forum Romanum. The Forum of Caesar was not rebuilt until AD 95, however, indicating that perhaps Domitian had a personal interest in the reconstruction. This could be seen in the separation of the Curia from the Forum, symbolizing a reversal of Caesar's wish to have the Senate closely connected with him. Not much senatorial business took place in the Forum afterwards, except for the secretarium senatus in the 4th century. The Forum of Augustus is one of the Imperial forums of Rome, Italy, built by Augustus. It includes the Temple of Mars Ultor. Augustus vowed to build a temple honoring Mars the Avenger, the Roman God of War, during the battle of Philippi in 42 BC. After winning the battle, with the help of Mark Antony, Augustus had avenged the assassination of his adoptive father Julius Caesar. Augustus became the first emperor of Rome in 27 BC, and plans for the temple to be built in a new forum began forming. It appears as if construction did not begin on the Forum until around 20 BC, when Augustus avenged Rome once again, this time by negotiating the release of the standards lost by Marcus Licinius Crassus to the Parthians. The land the Forum was to be built on was already owned by Augustus himself. However, the initial plans called for a bit more space than he had. In order to keep those on the land he would need to purchase to build upon, the plans were altered slightly, so some asymmetry is apparent, especially in the Eastern corner of the precinct; for which Suetonius states that Augustus did not dare to take the houses of the nearby owners by force.. This self proclaimed good deed was more than likely just a ploy to save Augustus money and trouble. These land issues, as well as numerous architectural mishaps, prolonged construction. The incomplete forum and its temple were inaugurated, 40 years after they were first vowed, in 2 BC. The Forum of Augustus was built to both house a temple honoring Mars, and to provide another space for legal proceedings, as the Forum Romanum was very crowded. Before battle, military generals set off from the Temple of Mars, after attending a commencement ceremony. Other ceremonies took place in the temple including the assumption of the toga virilis by young men. The Senate met at the Temple when discussing war and the victorious generals dedicated their spoils from their triumphs to Mars at the altar. Arms and other stolen goods from the enemy, or booty, recovered from battle were often stored in the Forum as well. The Forum lies perpendicular to the Forum of Caesar, presently divided from it by the Via dei Fori Imperiali, which was built over an unexcavated portion of the Forum, leaving vital clues of the design buried underground. Looking from the road, The Forum of Augustus is flanked on its left side by Trajan's Forum and on its right side by the Forum of Nerva. Immediately behind the Forum was the Suburra, a notoriously poor district of ancient Rome which was quite prone to fires. Therefore, a tall solid stone wall, that still remains, was built to protect the marble architecture of the Forum from fire, and to serve the dual purpose of blocking the view of the poor neighborhood. The design of the Forum itself was relatively simple. It consisted of one very large (125 meter x 90 meter) open space framed by marble colonnades on both sides. Sitting at the back of the Forum was the Temple of Mars Ultor. The temple stood atop a flight of stairs and the entryway was surrounded by a colonnade all its own. Inside the temple, a long cella ended with an apse containing statues of Mars and Venus. To both the left and right of the Temple, there were two semicircular rooms, known as exedrae. The exedrae housed the majority of the statues within the Forum. The Forum was one of the most beautiful buildings in its time. Pliny regarded it as one of the three most beautiful buildings he had ever seen. The other two were the Temple of Peace and Basilica Aemilia. The materials used in constructing it were both gorgeous and expensive. The wood used was cut from the Raetian Alps and recovered pieces could still be used today. The marble (cipollino) was some of the finest available. The Forum was filled with a rich tapestry of different statuary. Most notably were the statues of Augustus in full military outfit in the center of the Forum, and of Mars and Venus in the Temple. In total, there were 108 portrait statues with inscriptions of each individual�s achievements, providing an important idea of how Augustus viewed his role within Roman history. In addition to statues of all the Roman triumphatores, which were either made of bronze or marble and were placed along the left side of the Forum and in the left exedrae, the entire right side and right exedrae were full of statues of men in the Julian-Claudian family. They trace Augustus�s lineage down through the fourteen Alban kings to the founding ancestors Aeneas and Romulus. These figures reinforced the importance of both Roman lineage but also of the prestigious lineage that Augustus himself held. By advertising this lineage he reinforced his power and authorities as a leader. Also, by placing himself amongst great figures and heroes, he further portrayed himself and his own importance. He paints himself as one of �the greats� worthy of the power he held. While all the elogia reads the deeds of these great men, Augustus� Res Gestae Divi Augusti acts as a direct parallel. The statues in the forum provided excellent reasoning for Augustus to claim his restoration of the Republic. Not only were the great men of Rome�s past being honored through their busts, but Augustus was also establishing his ancestry to these men, either by blood or spirit. This provided Augustus with another connection between himself and the old Republic, an era of Roman history he continuously tried to invoke during his reign. In 75 AD, under Emperor Vespasian, another great square was built. Separated from the Forum of Augustus, the Forum of Caesar and the Via dell'Argileto which connect the Roman Forum to the Subura, the temple faced the Velian Hill (in the direction of the Colosseum. The fact that this structure is not mentioned as having a civil function has prevented it from being classified as a true Forum. Therefore the structure was simply identified as the Temple of Peace (Templum Pacis) until the late Empire. Also the shape of the square was different: the temple was constructed by a large apsidal hall that opened up like an exedra at the bottom of the portico. A row of columns distinguished the portico from the temple. The central area was not paved like other fora, and it served as a garden, with pools and pedestals for statues, so that it was similar to an open-air museum. The monument was built to celebrate the conquest of Jerusalem. One of the chambers opened at the end of the porticos housed the Forma Urbis Romae, a marble map of antique Rome, made in the Severan period (3rd century) by drawing on the marble slab that covered the wall. Domitian decided to unify the previous complex and the free remaining irregular area, between the Temple of Peace and the Forums of Caesar and Augustus, and build another monumental forum which connected all of the other forums. The limited space, partially occupied by one of the exedras of the Forum of Augustus and by the via dell'Argileto, obliged Vespasian to build the lateral porticos as simply decorations of the bounding walls of the forum. The temple, dedicated to Minerva as protector of the emperor, was built leaning on the exedra of the Forum of Augustus, so that the remaining space became a large monumental entrance (Porticus Absidatus) for all the forums. Because of the death of Domitian, the forum was inaugurated by his successor, Nerva, who gave his own name to the forum. The Forum of Nerva is also known as Transitional Forum, because it worked as an access way, just like via dell'Argileto had done. 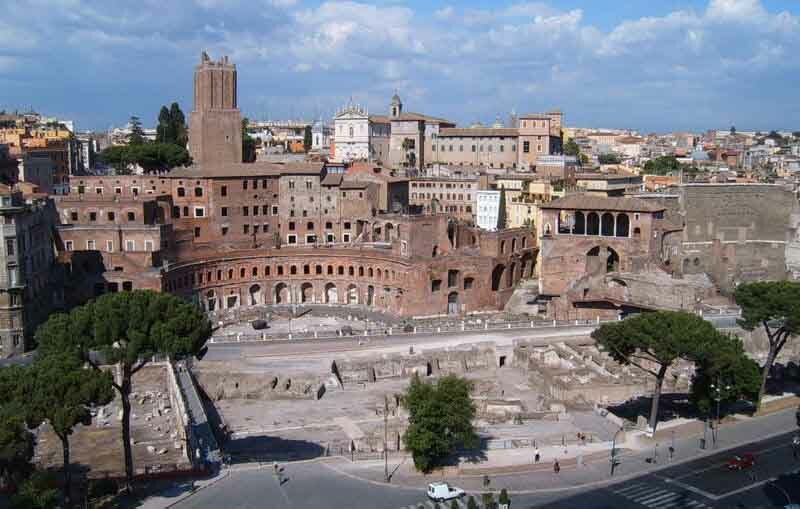 Trajan's Forum is chronologically the last of the Imperial fora of Rome. The forum was constructed by the architect Apollodorus of Damascus. The forum was built on the order of Emperor Trajan with the spoils of war from the conquest of Dacia, which ended in 106. The Fasti Ostiensi (see Fasti) states that the Forum was inaugurated in 112, while Trajan's Column was inaugurated in 113. It is possible that the excavations were initiated under Emperor Domitian, while the project of the Forum was completely attributed to the architect Apollodorus of Damascus, who also accompanied Emperor Trajan in the Dacian campaign. During the time of the construction, several other projects took place: The Markets of Trajan were constructed, Caesar's Forum (where the Basilica Argentaria was built), and the Temple of Venus Genetrix were renovated. 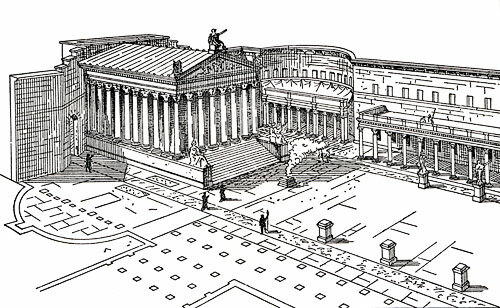 The Forum was built from a vast stoa-lined piazza measuring 660 by 390 feet (200 x 120 m) with exadrae on two sides. The main entrance to the forum is on the southern side, a triumphal arch surmounted by a statue of Trajan in a six-horse chariot. The Basilica Ulpia lies at the north end of the piazza, which was cobbled with rectangular blocks of white marble and decorated by a large equestrian statue of Trajan. On either side of the piazza are markets, also housed by the exedrae. North of the Basilica was a smaller piazza, with a temple dedicated to the deified Trajan on the far north side facing inwards. Directly north of the Basilica Ulpia on either side of the forum were two libraries, one housing Latin documents and the other Greek documents. Between the libraries was the 125-foot (38 m) Trajan's Column. In the mid-4th century, Constantius II, while visiting Rome, was amazed by the huge equestrian statue of Trajan and by the surrounding buildings. 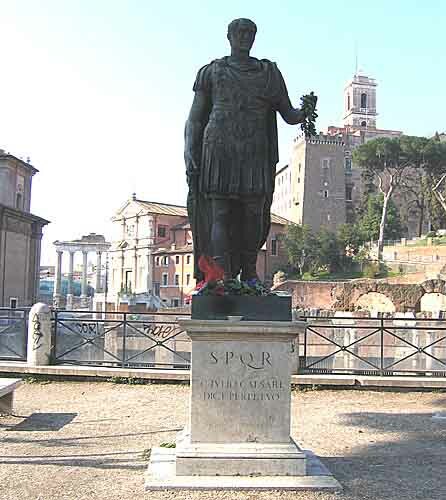 The imperial visit and the landmarks of the forum were described by historian Ammianus Marcellinus. 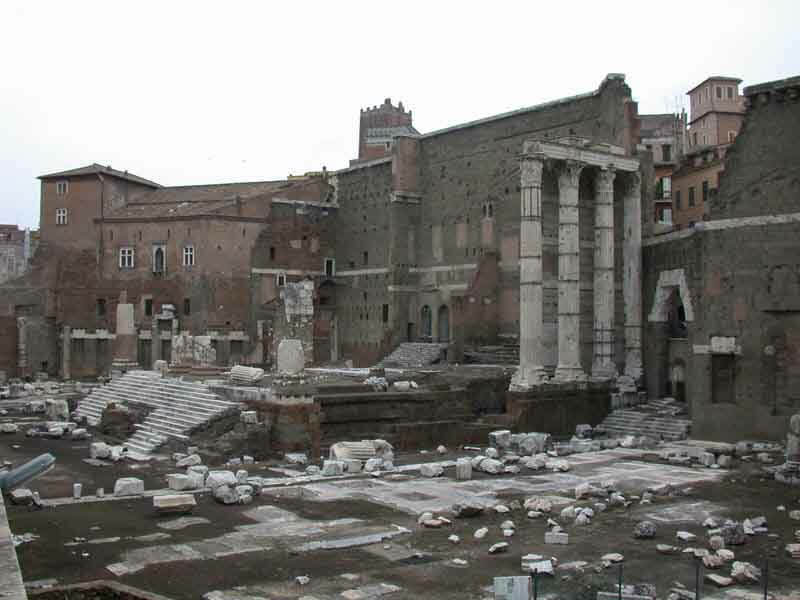 In modern times only a section of the markets and the column of Trajan remain. In the mid-9th century, the marble cobble blocks of the piazza were systematically taken for re-use, because of the good quality of the lime. At the same time, the pavement was restored in wrought as a sign that the piazza was still in use as a public space.